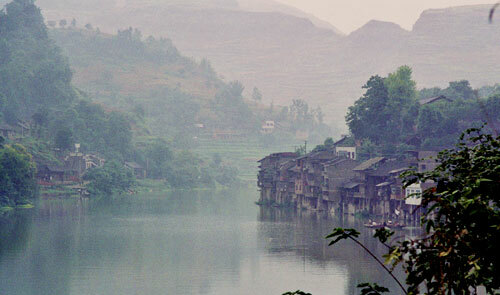 Chishui 赤水, in the northeast of Guizhou province 贵州省, is a small but prosperous town. 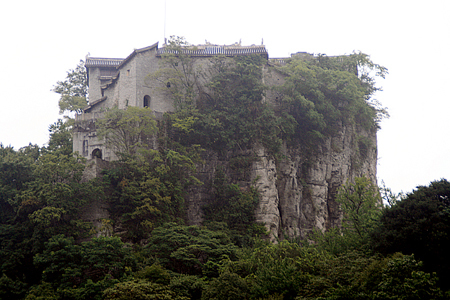 It owes its prosperity to its strategic location on the Chishui River 赤水河 (Chishui means Red Water), right on the border with Sichuan 四川. It’s a beautiful and fascinating area to explore if you have time. The only other tourists you’ll meet here will be Chinese. 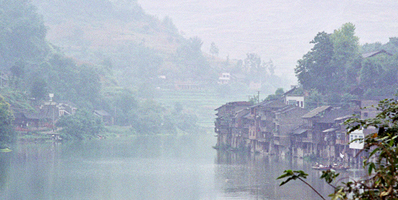 The Chishui River 赤水河 was once part of the imperial Salt Route, which provided Guizhou with this precious condiment for many centuries. The river continues even today to be a busy commerial tranport route between Guizhou and Sichuan, with large flat bottom barges plying up and down between towns. Whether you are leaving Guizhou Province from the West, or entering it from Eastern Yunnan, you’ll probably end up passing through Xingyi (see Map), a small town undergoing rapid development. To be honest, Xingyi is not the prettiest of towns, though we didn’t find it quite as grim as it was depicted in our guidebook. 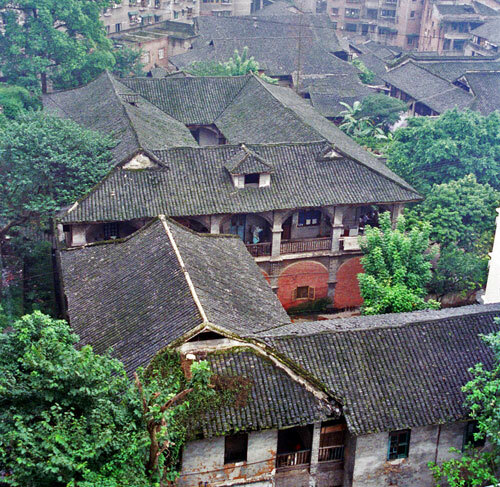 It is true that the town is entirely lacking in sights and has lost all its old neighbourhoods to the rampant white-tile and concrete construction that continues to proliferate in China. However, it’s a pretty laid- back place and its major sight, the Maling Gorge, just a few kilometres out of town and easy to reach, is truly spectacular. 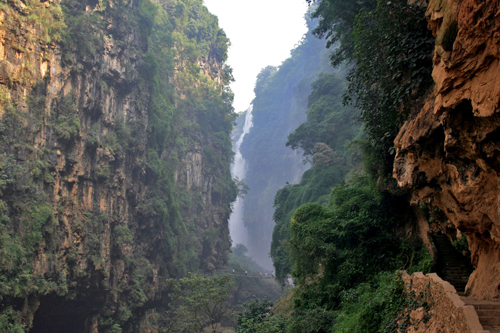 Locals also recommend visiting nearby Fenghuang Shan (Phoenix Mountain 凤凰山), which they claim is another natural wonder not to be missed. Unfortunately, we didn’t have enough time to check this out. We arrived in Xingyi on a bus from Anshun 安顺. 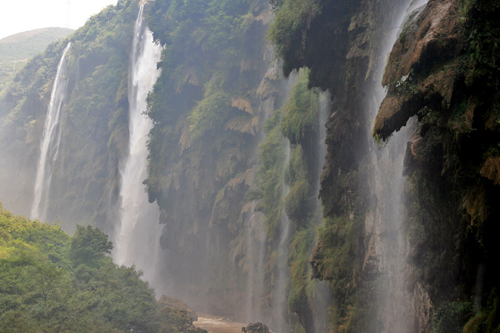 The journey took around six hours and passes through some of the most dramatic limestone scenery you are likely to see. When we get into the lift and look down at our feet, we discover that yesterday’s floor mat, which read ‘Wednesday’, has been replaced by a ‘Thursday’ one. We wonder if this is a new fashion and whether there might be a special member of staff, responsible for keeping the lift mats up to date. 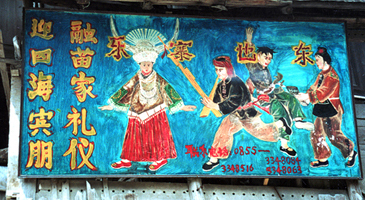 We didn’t really know what to expect when we arrived at Tunbao village, next to the larger town of Tianlong. 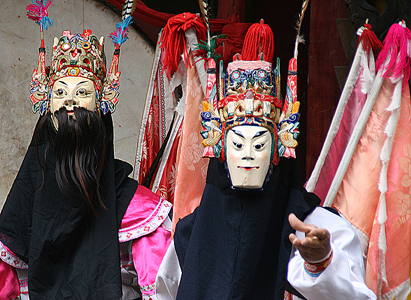 We had heard that it was home to a special group of Han Chinese who still dressed in Ming clothes. Although we had wondered whether it was going to be some themed, Disney-style village to amuse Chinese tourists, we were actually pleasantly surprised. 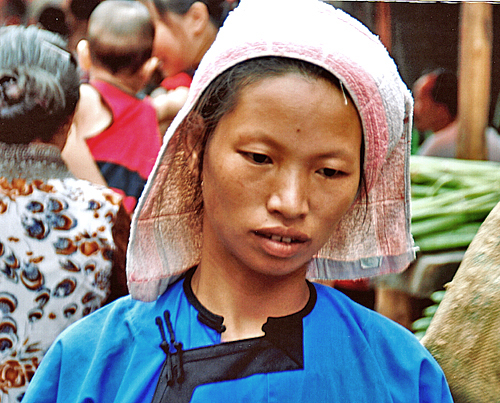 The first thing we discovered came as a total shock: the women in Ming dress were the same ones we had seen haggling at Anshun market, or working the fields in nearby villages. 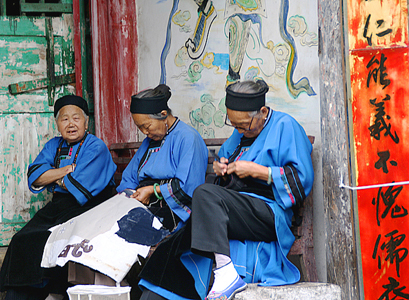 We had previously mistaken them for Bouyi, but from our previous visit to Shitou Zhai we had learnt that they wear darker clothes, embroidered in the different way. 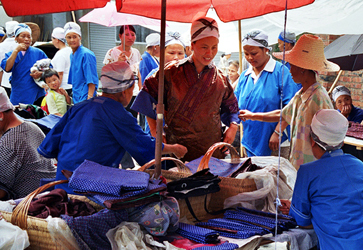 The ladies in Ming dynasty clothes were definitely authentic; there were not only old ladies, but many young girls too, who continued to sport these traditional garments. 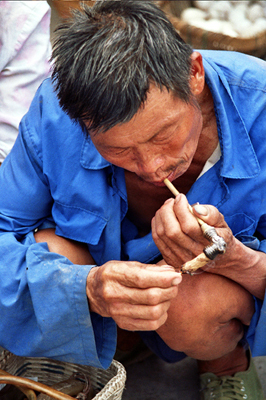 There seems to be an area of villages and towns around Anshun where this practice continues. I’ve never felt comfortable about visiting small villages, only to gawp at the exotic inhabitants. When trekking or walking in the countryside, passing through a remote village can be a rewarding experience and a nice break, but I am always glad to move on, unless I am going to eat there or stay the night. 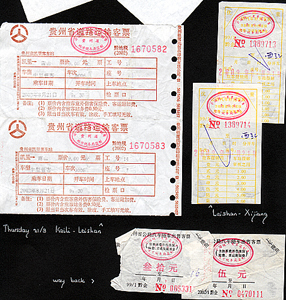 So it was with some conflicting thoughts that we set off to visit the Long Horn Miao. 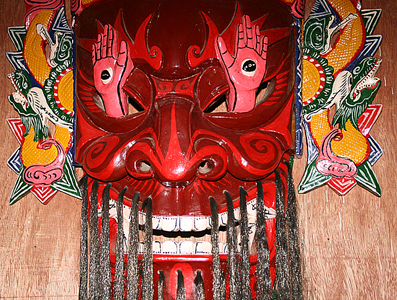 I am not an Anthropologist, my degree is in East-Asian History. 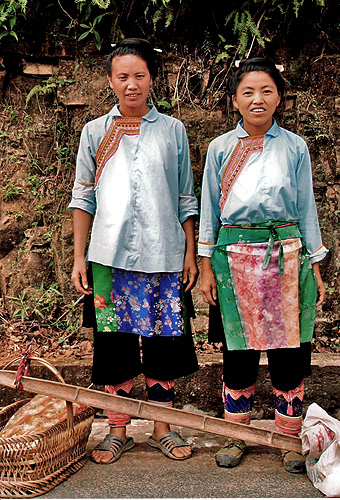 So it is difficult for me to pontificate on what should or should not be done about the Long Horn Miao villages. I enjoyed the visit. I took some great photos. The scenery is stunning, the costumes and hair are fantastic and the villagers friendly. Nevertheless, I can’t help wondering what impact tourism will have on their society. 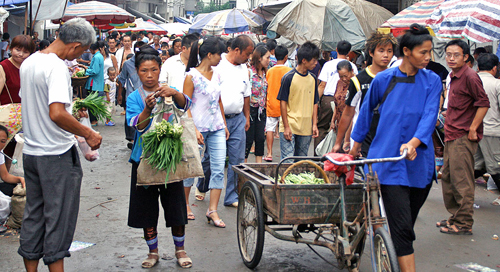 Are we, as some of the first tourists, only the shock troops that will pave the way for hordes of well-heeled Chinese and Western tour groups on ‘adventure’ holidays who will commercialise and eventually destroy the Long Horns’ traditional lifestyle? It is something that worries and disturbs me – though I can imagine many of you thinking ‘you shouldn’t have gone then..’. 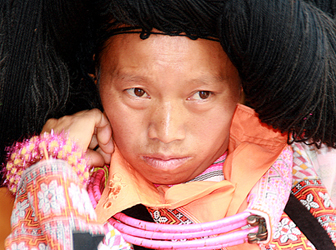 On the other hand, and looking on the positive side, tourism might help the Long Horn Miao to preserve their culture. 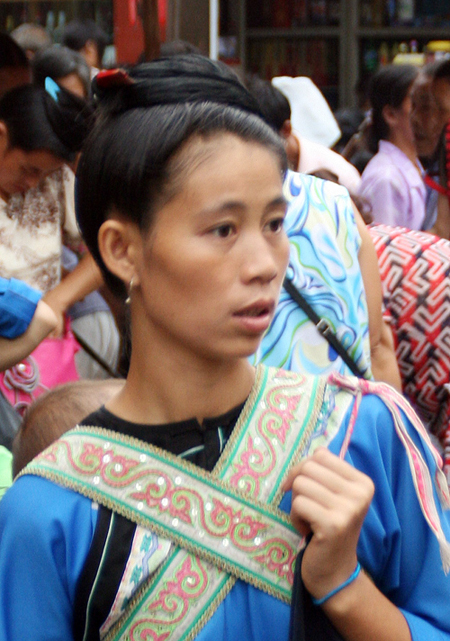 By learning to take pride in their ethnic culture and being able to earn a living from it, the exodus of the younger Long Horns to the towns might be halted. 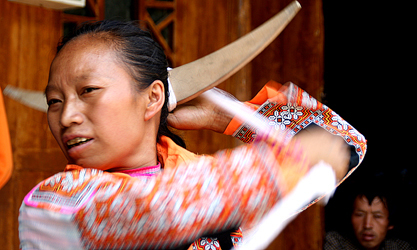 Change is inevitable, and the modern world has already caught up with the Long Horn Miao. 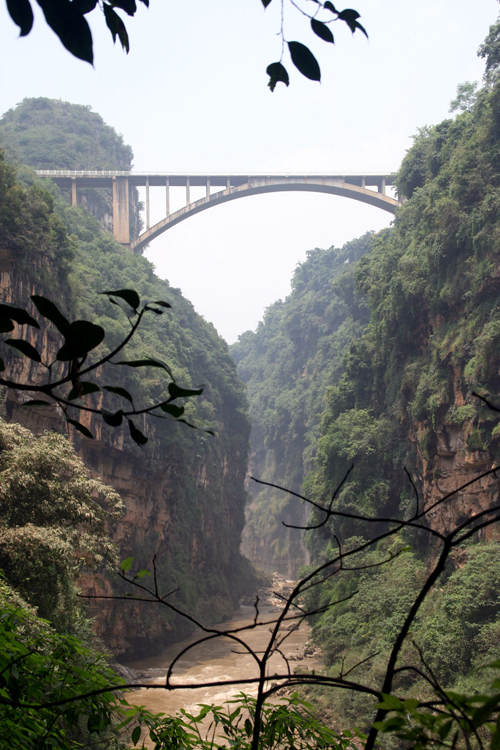 The young children go to school in Soga, which is only an hour and a half away from the large town of Liuzhi, which in turn is connected to Anshun and Guizhou’s booming capital, Guiyang. 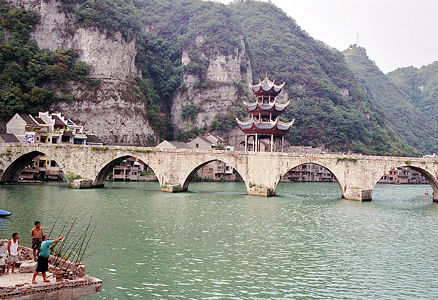 The pretty and interesting town of Zhenyuan lies in the far east of Guizhou, not too far from the Hunanese border and can be easily reached by train from the railhead town of Huaihua in that province, or by bus from Kaili and Taijiang in Guizhou. 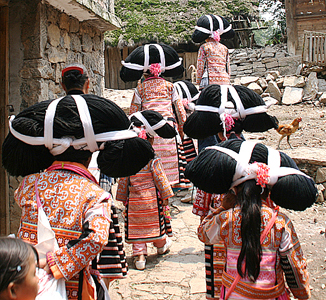 Apart from being pretty, Zhenyuan is close to some remarkable scenery and is also home to many of Guizhou’s Miao minority, even though in town very few people wear traditional costume and are mostly indistinguishable from the Han majority. 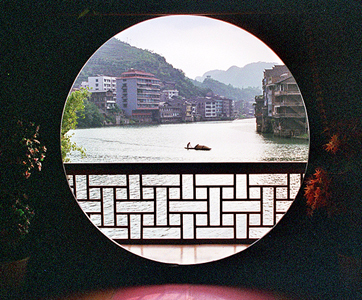 For the traveller it is worth spending a few days in Zhenyuan to soak up the relaxed small town atmosphere, unwind in a riverside teahouse, snoop around the ancient back alleys, and visit…. 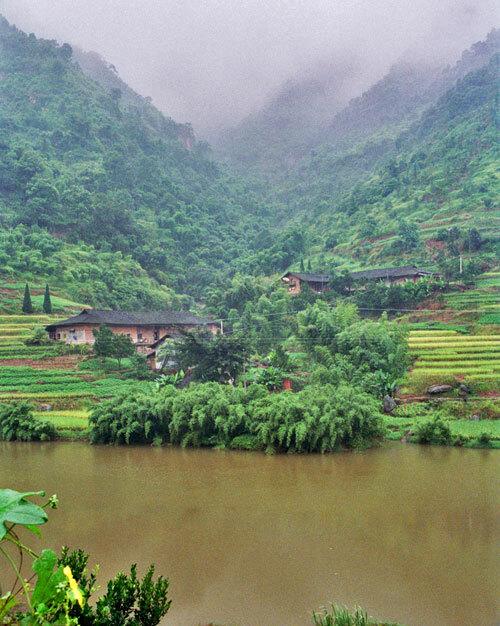 This triangle linking the south of Sichuan province with the north of Guizhou is a great combination of lush subtropical scenery, traditional villages and impressive architectural monuments. 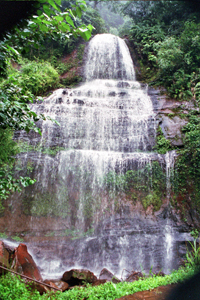 Yet, in spite of its attractions, the area has not been put on the tourist map, which only contributes to its charm. 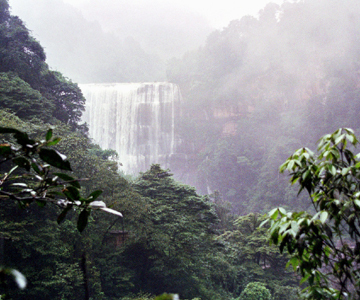 This route is equally feasible from Chengdu, capital of Sichuan, or from Guiyang, capital of Guizhou, given that the bus connections are good both ways. 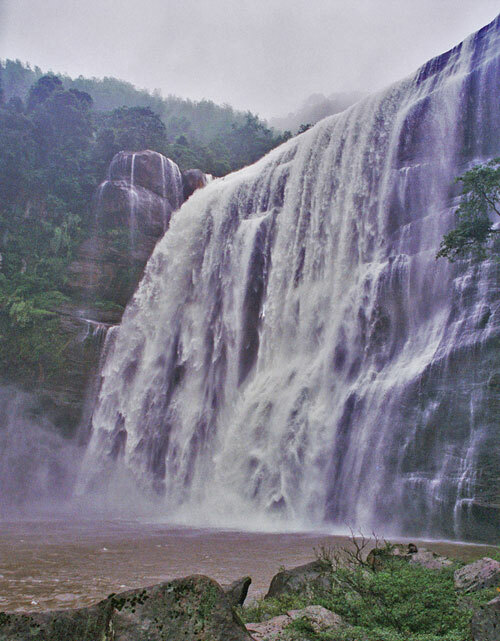 If you start from Guiyang, like we did, you may find the first part between Guiyang and Chishui, a bit long and tiring, though you could always break up the journey in the historical city of Zunyi….